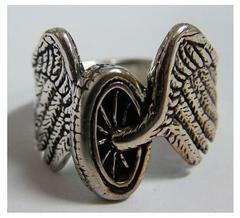 This sterling silver motorcycle wheel and angel wings biker ring is made in the USA. The face of this biker ring is approximately 3/4" wide (1.905) and the band tapers to 3/8 inch wide (.9525) in the back. This biker motorcycle ring is available in 1/2 size increments from 7 to 14. Use the dropdown menu below to select the size you want. This biker ring can be combined with other rings that are the same price to meet quantity discounts. Our catalog will automatically recomputed prices when the next discount level is reached.